With the help of a $10,000 grand from BP Oil through their A+ For Energy program, Fort McMurray's Ecole Dickinsfield School helped embrace the city's bag ban. Your school can encourage a bag ban too! 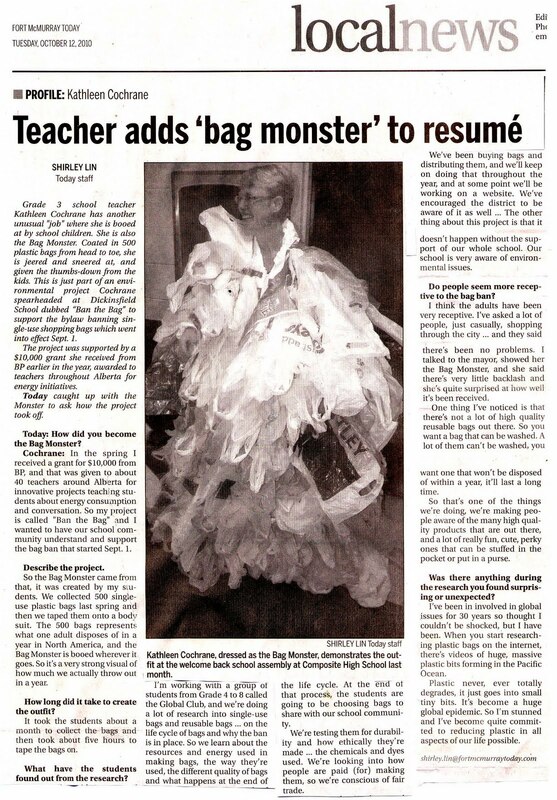 The Bag Monster was created with 500 single-use plastic bags collected by students, representing the number of plastic shopping bags that are disposed of each year by each person in North America. 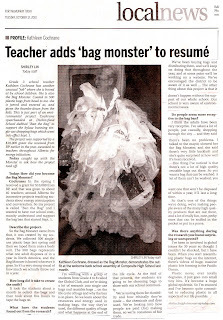 The Bag Monster came to school events throughout the year. At the first school staff meeting of the year, high quality reusable bags and information were given out, encouraging staff to embrace the ban and educate our students. 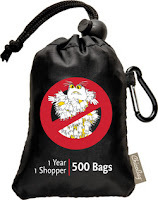 At the first district staff meeting of the year, The Bag Monster encouraged everyone to embrace the bag ban. Sean Graham, the 18 year old student who started the ban, was arranged to speak about the influence a teacher and a student can have. The school had an assembly on the Bag Ban day with Sean Graham and the Bag Monster. Media was contacted. The articles and photographs of Sean and our Bag Ban went nation wide. Throughout the year, the Global Club, Grade 3 and Grade 4 students researched, tested, and shared many different kinds of reusable bags with students and families. 12 Red Wriggler composting worms and buckets were set up in our school and district. During Earth Week the buckets visited each classroom so they could learn about waste and which materials can be composted. Each month, information about garbage, plastic versus paper, single-use bags, reusable bags, animals affected by trash, the Great Pacific Garbage Patch, etc. was shared in the school/home newsletters. Information was shared with the school community via a bulletin board. Throughout the year students explored different websites and You-tubes for information on the energy and pollution that are part of the life cycle of various bags. The Global Club conducted a school wide survey on family attitudes before the Bag Ban and 4 months into in, and shared the results. The Global Club conducted a composting experiment to see what can be composted (they learned that plastic never rots). The Global Club created a powerpoint and prezis to present to other students with information on the life cycle and issues with paper bags, plastic bags and garbage. Information was shared with district staff (through e-mail) on bags, bag issues and resources. Reusable bags and information were shared with the larger community at 4 different events. "Earth Week" was held school wide, with daily information and acitivities on the problems of waste, composting, the contents of garbage, energy used, getting political and making changes. Classes wrote letters to a politician of their choice encouraging others to embrace a bag ban. For a day during Earth Week, the Bag Monster and Grade 6, 7, and 8 students visited Kindergarten to Grade 4 classrooms to give 30 minute talks on how bags are made, the energy and materials required, the pollution created, the problems and benefits of different kinds of disposable and reusable shopping bags. The Bag Monster gave a high quality reusable Bag Monster Chico Bag to each student and staff member in the school. Lessons were developed to help teachers and students learn about the energy and resources used in the life cycle of various bags, and the issues around waste. Photos were taken and this website was designed to share information with the school, district and larger global community. 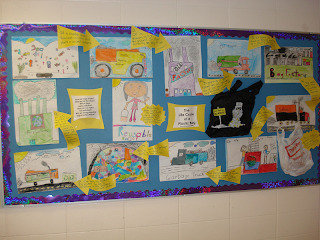 Grade 3K drew pictures of the life cycle of a plastic bag. Pollution! Bulletin boards taught the school community about bags: how they're made and problems. the local Fort McMurray Today paper.